Partnering for Economic Empowerment and Renewal. Transforming Lives. 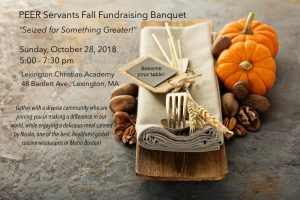 We’d love to have you join us for our 2018 Fall Fundraising Banquet on Sunday, October 28, 5:00-7:30 pm at Lexington Christian Academy. It will be a fun evening of great food and fellowship, global music, and inspiring stories of micro-entrepreneurs, students, and young people from around the world. Our goal is to raise at least $50,000 to support programs that are empowering the materially poor. You do need to RSVP by Sunday, October 21 – click here to do so and get more information on what’s going to be a fantastic night. A Record-Setting Walk for Economic Empowerment!